A character rife with contradiction is the Princess Mononoke herself, voiced by rising young star Claire Danes. Danes plays the young woman known as San with as a spirited rebel looking for her own identity. 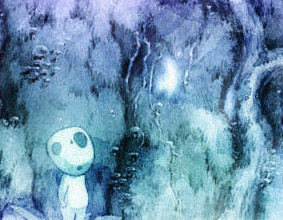 During one battle, San is seen by Ashitaka, the Princess Mononoke, a young woman raised by the wolf Moro, who is prepared to die to defeat the humans. Both just try to defend the forest spirit, who is hunted by Lady Eboshi.